Finally, in the fall of 2016, the studio got the order for the full 'floor to ceiling' restoration of the sanctuary and nave. Building on the 'good bones' of this T.J. Collins design, the renovation/restoration project honored the architecture while upgrading the finishes and acknowledging the changes in worship style. The project was completed in the spring of 2017, just in time for Lent and the most beautiful Easter celebration in decades. Click here to see more images from this special project. All Saints Catholic Church in Manassas, Virginia is home to a beautiful new mosaic depicting the Visitation. 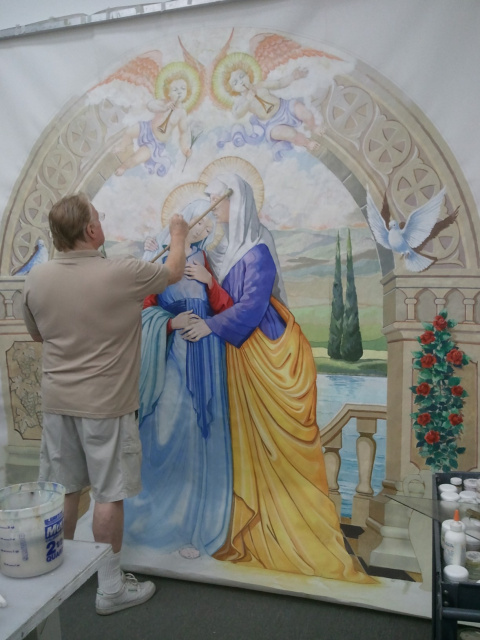 It was designed by our own Ronald Neill Dixon, who then created a full size painting of the scene which was sent to Italy where skilled artisans cut and assembled tens of thousands of small tiles to recreate the image in this ancient medium. The mosaic was then installed by Dixon Studio craftsmen three stories up on a transept wall. The completed work measures 9' wide x 10' tall. See a short article and lots of photos of the installation here. Not content with the catalog offerings, the committee at Our Lady of Perpetual Help in Salem, Virginia was determined to have something unique and beautiful to enhance the choir area. The committee members fell in love with the design concept of a choir of angels... but not so much with the cost. And yet, once they had envisioned this, everything else looked cheap. So, they took a leap of faith and presented the design -and budget- to the parish and were gratified to find tremendous support, both emotional and financial, for the project. The full size drawing, detailing all the fingers and folds, hairdos and expressions, postures and instruments, was created in the studio in Staunton, then rolled up and sent to a carving studio in Italy where every detail was faithfully executed in wood. The final work was shipped back to Virginia and installed by our own craftsmen. prior to shipment in the spring of 2013. 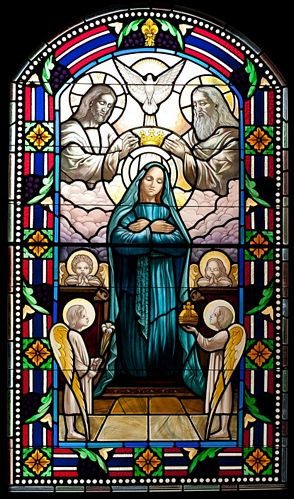 Following the recent installation of the final stained glass windows in a series of 20 depicting the Mysteries of the Rosary, the Arlington Catholic Herald featured the project in a two-page spread! 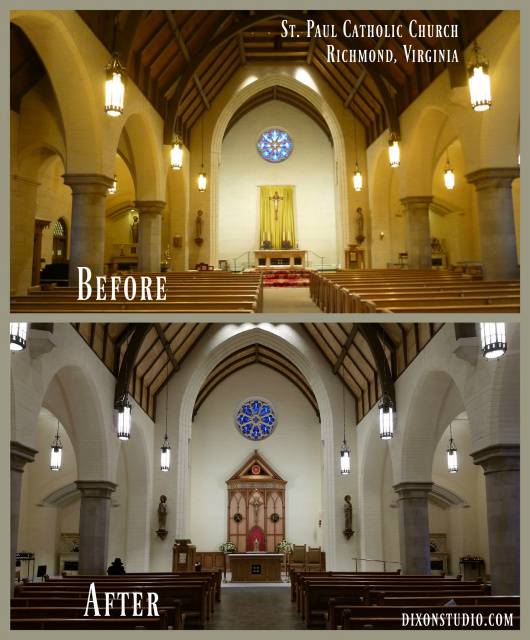 Designed and fabricated by Dixon Studio, all of the Joyful, Sorrowful, Glorious, and Luminous Mysteries now shine in to the worship space at Holy Trinity Catholic Church in Gainesville, Virginia. The church, designed in the Gothic style, was completed in 2008 and also contains sanctuary furnishings, statuary, and stations from Dixon Studio. Click here to read the online version of the Herald article. Click here to see all the windows, photographed by professional photograper Rassi Borneo. The largest church in the Arlington Diocese was dedicated in mid-August and contains numerous items from Dixon Studio. In addition to a dramatic Holy Spirit window over the sanctuary and a lively Communion of Saints window over the entrance, the studio proided the wooden crucifix, marble Mary & Joseph statues, the tabernacle, two mosaics, and a hand carved wooden statue of St. Elizabeth Ann Seton. The sanctuary window can be seen on the July 2010 page of the construction gallery at the church website. 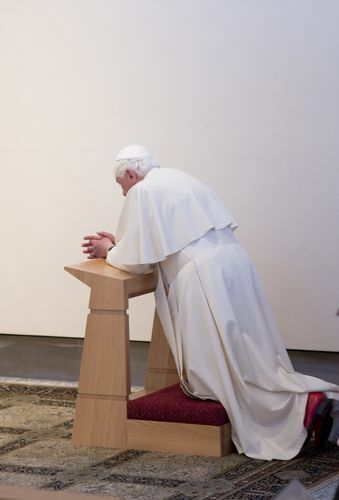 In preparation for the arrival of Pope Benedict XVI in Washington DC, Dixon Studio was commissioned by the Pope John Paul II Cultural Center to create a custom prie dieu for its chapel, where the Pontiff prayed on April 17, 2008. Designed by Ronald Neill Dixon to coordinate with the existing pieces in the contemporary space, the kneeler is constructed of American oak and upholstered with a rich red and gold fabric. Dixon's talent came to the attention of the Center's staff in 2006, with the installation of his Divine Mercy mosaic donated by the Marian monastic order. He has been called in for a few consultations since, and then was asked to design the kneeler and to tweak a few architectural features in the Center prior to the Papal visit. And, to complete the composition, Dixon Studio lent a gorgeous altar rug from its inventory to the Center. 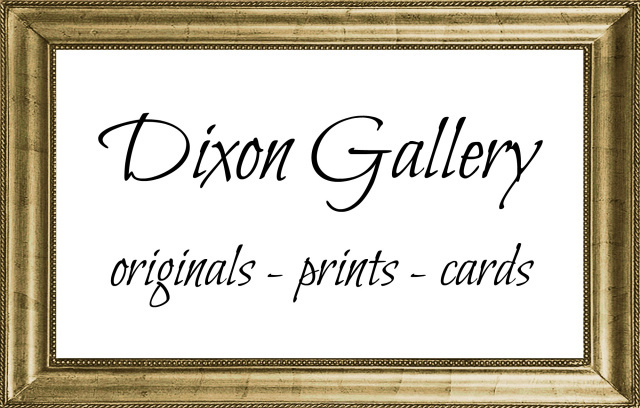 a division of the Dixon Arts Guild, Inc.
All website text & illustrations ©1999-2019 Dixon Arts Guild, Inc.
without express written permission from the Dixon Arts Guild.